Adam Miller, a practicing attorney specializing in representing school districts, educational service centers and statewide educational associations, proudly serves constituents of Ohio’s 17th House District. In addition to his legal career, Adam is a former elected School Board member, former public school teacher and superintendent of schools. He assists school district leaders in a host of legal matters, including labor contract negotiations, student legal issues, administrative contracts, Board of Education policies and governance, arbitrations, and education sector litigation. Adam is particularly versed in the legal aspects of education grants, school finance, community and alternate schools and their impact on traditional public school district operations. Adam contributes his talents to many organizations. 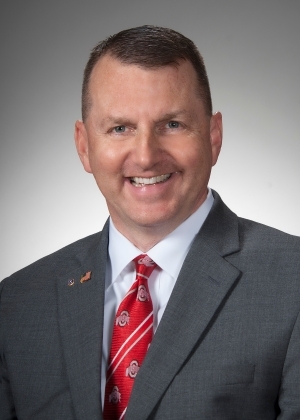 He is a Board member with Operation Legal Help Ohio, Pro-Bono Veterans’ project and is a former chair of the Ohio State Bar Association Military and Veterans’ Affairs Committee. In this role, Adam helped start a statewide non-profit organization dedicated to serving the legal needs of veterans and military families. He presently holds the rank of Lieutenant Colonel in the Army Reserve. Adam is a U.S. Army Reserve Judge Advocate General’s Corps Officer (1996 – present) and served with the 10th Mountain Division during his deployment to Afghanistan in 2004. Adam currently serves as the Staff Judge Advocate, 103rd ESC, formerly the Deputy Commander of the 6th Legal Operations Detachment, USAR Legal Command. Adam was recently awarded the US Army’s Meritorious Service Medal (MSM) and will graduate from the US Army War College in 2017.